I've always loved the Aliens films (well at least the first two), both films work for very different reasons. The first was totally ground breaking with it's unique style, examination of claustrophobia, fear - the combination of science fiction and horror that combined with some exceptional music, directing, special effects and casting. The sequel managed to do something that very few sequels have before or since and that's create something that matches the original in terms of quality and yet is vastly different. I've also been a fan of the expanded universe (along with HR Giger's artwork) and eagerly collected not only the Alan Dean Foster novelisations but the novels that were written afterwards by authors such as Steve Perry, Stephani Perry, David Bischoff and Robert Sheckley - published in the 90's by Bantam books. 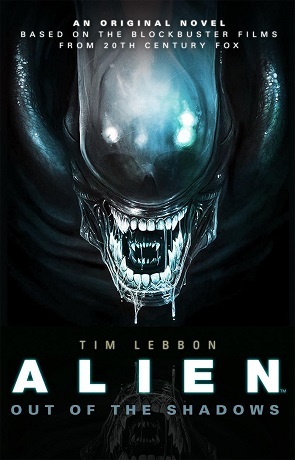 When I heard that Titan Books were publishing further original stories within the Aliens Universe I couldn't resist reviewing the first novel - especially coming from the talented pen of Mr Tim Lebbon. Out of the Shadows is set between the events of the first two films, after Ripley has escaped in the shuttle Narcissus with only Jones the cat for company, facing a long snooze in statis. It's an interesting idea to fill this gap and works surprisingly well, including careful thought not to disrupt continuity. I'd be happy to see an Aliens film based on this book (much better than the disappointing Prometheus). The book manages to capture the best features of both films, the dark and hidden terror of being pretty much at the mercy of some huge alien with razor sharp teeth and acid for blood and the resoluteness of fighting back against such a menage armed with little more than a few guns and human ingenuity. We've got face-huggers, chest bursting and a high death count along with some fairly spectacular ship crashes and some wonderfully written exploration that reminded me of the "Space Jockey" scene features in the original film. We've also got another old character making an appearance and this works well, integrating with the whole canon and being part of the way they fit the story in without upsetting continuity. While the plot is fairly straight forward its also very well written and totally engaging. The author manages to get the character of Ripley spot-on, a reflection on the author's talents. The pace is fast and fluid and the action tense and dramatic. For me Out of the Shadows fit's in perfectly with the Aliens universe, much more so than recent films I won't mention. It's a solid novel that keeps the reader gripped right the way through and does justice to the original stories. Perfect for any Aliens fans. Written on 24th February 2014 by Ant.